Erected in the closing years of the Tokugawa period, the Main Sanctuary has been designated by the Japanese government as an Important Cultural Asset. 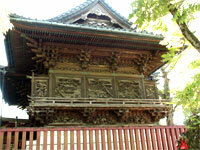 The building is fashioned in the Gongen zukuristyle with a hip-gable roof sheathed in copper. The pillars and beams around the Sanctuary are decorated with numerous wood carvings, giving it an intricate and elegant appearance.